This was largely just a catch up from June where my direct share investments were down $12,900. Not a lot happened this month however I did receive some dividends which are sitting in my cash accounts and which need to be reinvested in direct shares. I'm currently sitting on about $15,000 in cash which I'm looking to deploy. I missed a real opportunity in the panic that was created by the Brexit vote and I'm kicking myself for not getting in and buying when the opportunity was there. 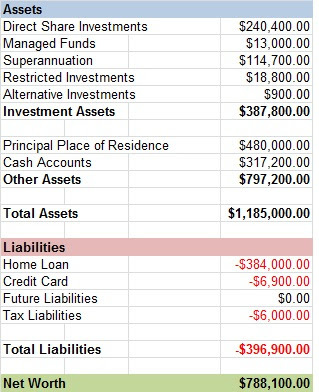 This category continued to perform quite well driven by my superannuation balance bouncing back, additions to my superannuation account by my employer and continued contributions to my employee share plan. I have about $900 sitting in cash accounts waiting to be invested in alternatives. I am mulling about whether to put this into coins or to let it build and then buy some artwork or some other alternative investment like that. 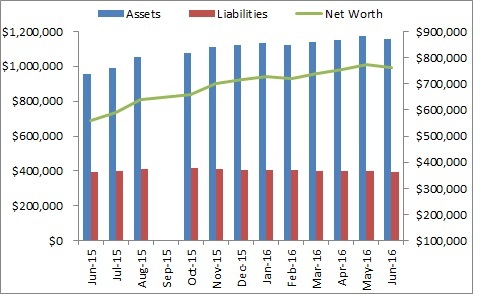 The increase in our other assets this month was basically contributions to both our home loan offset account as well as cash which is sitting in there waiting to be deployed to other accounts (like my share accounts or alternative investments). I wouldn't expect increases to be this large going forward. My liabilities balance increased this month as we spent more on our credit card on various expenses including renovations and other more personal type expenses. Our credit card balance hasn't been this high in quite a long time and I would hope to bring it down more around the $4000 mark going forward. Whilst I haven't gotten my financial situation to exactly where I would like it to be, it is a whole lot more ordered than where it was a year ago. I am finding that having a plan and working towards it leads to much more consistent decision making on my behalf.